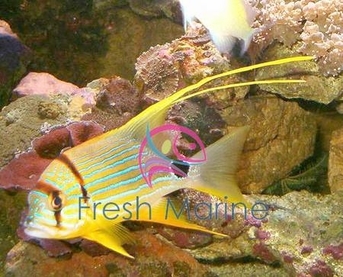 https://sep.yimg.com/ay/yhst-33477391359232/hifin-snapper-symphorichthys-spilurus-threadfin-majestic-snapper-fish-9.jpgHifin Snapper - Symphorichthys spilurus - Threadfin - Majestic Snapper Fish DifficultPeaceful200 Gallon23.6 inchesNoCarnivore, Pellet, MeatyWestern PacificLutjanidaeSmall 2" - 3"
Hifin Snapper - Symphorichthys spilurus: The Hifin Snapper , also known as the Thread Fin, Bluelined Sea Bream, or the Sailfin, Hifin, Majestic, or Blue-Gold-Striped Snapper, is an extremely fast-growing fish. As a juvenile, it has a black stripe running laterally from the eyes to the tail. This disappears with maturity, and is replaced by a series of lateral blue lines against its increasingly yellow body. The posterior portion of the dorsal fin and tail grow quite long. It is compatible with other fish, but is bothered by those that nip on its long fins. The Hifin Snapper is a fast growing fish.This is very shy fish and likes to hide. The Hifin Snapper must be seen in person to be fully appreciated. It has a golden yellow body flanked by bright blue horizontal bars, two vertical black head bands and a dark caudal spot. Is fairly hardy as far as snappers go. Juvenile coloration is slightly different than adult coloration. Maximum Size: The Hifin Snapper grows upto 24 inches in length. General Size: This fish generally comes in size varying between 2 to 7 inches. Tank Conditions: The Hifin Snapper should ideally be kept in temperatures between 72 and 78 degrees Fahrenheit. A pH value of 8.1 or 8.4, and a specific gravity of 1.020 to 1.025 should be maintained. When kept with invertebrates, the specific gravity range should be 1.020 to 1.025, for the invertebrate species. In a fish only aquarium, the specific gravity should fall between 1.020 and 1.023. Diet and Feeding: The diet of the Hifin Snapper should consist of meaty foods including chopped meats, scallops, shrimp, and marine fish. Habitat: The Hifin Snapper is found in coral reefs of Western margin of the Pacific including New Caledonia, the Great Barrier Reef of Australia, New Guinea, Sulawesi (Celebes), Admiralty Islands, Palau Islands, the Philippines, and the Ryukyu Islands; also known from Rowley Shoals in the eastern Indian Ocean off Broome, Western Australia.